DETROIT, MI -- (MARKET WIRE) -- August 11, 2005 -- What started out as a dare, ended up as a reality for Attorney Herbert A. Sanders. 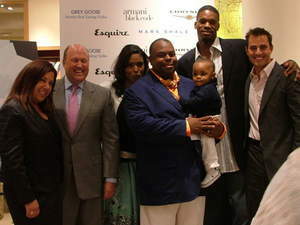 Sanders is the only Detroit finalist in Esquire magazine's "2005 Best Dressed Real Man in America" competition. In the Spring of 2005 Esquire magazine started its search for the best-dressed man in ten major cities: Atlanta, Boston, Chicago, Denver, Los Angeles, Miami, New York, San Francisco, Dallas and Seattle. Thousands of well-dressed men showed up for the competition but the Esquire editors only selected five finalists. As a finalist, Sanders was flown to New York for a photo shoot, which will be featured in Esquire's September issue (in stores by the middle of August). America will cast the final vote on-line, and the winner will be announced live on the "Today Show" in September. The grand prize winner will also walk away with a new Chrysler Crossfire, a Macy's shopping spree and other prizes. Sanders is a graduate of Michigan State University and the University of Michigan Law School. He is founder of the law firm of Sanders & Johnson, PLLC and specializes in civil litigation, labor and employment relations. Herb Sanders & His Son With Representatives of The Contest.